Pick up the phone and call (201) 327-5258 today for access to professional Ramsey paver sidewalk, driveway, patio and apron services. Pavers add quite a lot of character to your property, so give us a call and we will provide you with a free estimate. Check out our current online deals and coupons when you click here. In the world of landscaping and exterior home design, pavers are decorative stones that can be used as an alternative to asphalt and concrete. They can be used for walkways, sidewalks, patios and even full driveways. Pavers aren’t for everyone, but if you’d like to try something different and really add some character to your property, pavers may be the way to go. Learn what other people in your area think of our services when you click here. When you opt for using pavers for a driveway or sidewalk, you’ll see some benefits over doing things the traditional way. Paving stones can be removed easily once they have been installed and are relatively easy to repair. You can remove small sections and replace them without any evidence, while trying to repair smaller sections of asphalt or concrete will show where the damaged was located. You also won’t have to worry about oil stains on your driveway if you use pavers, and the normal fading from the sun that happens with asphalt driveways won’t be an issue. A polymeric joint sand can be used to prevent weeds or grass from growing up between the stones. The space between the sidewalk and the curb is known as the apron. Sometimes, a homeowner will have the top portion of the driveway done in asphalt and the apron in pavers. Having just the apron constructed in paving stones adds a stylish touch to the rest of the driveway and the entire property. There are several materials and styles to choose from if you’re thinking about installing pavers in your driveway apron, so you’re bound to find one that meets your personal style preferences. Can I Try the DIY Approach? If any driveway or sidewalk paving method was designed with the DIY group in mind, it is paver stones. Laying them properly isn’t simple, but it’s a far cry from having to mix concrete or asphalt and spread it so it is perfectly level. There is still the preparation to consider, and there is always the drainage issue, so if you aren’t completely comfortable with every aspect of the process you should hire a professional contractor to do it for you. 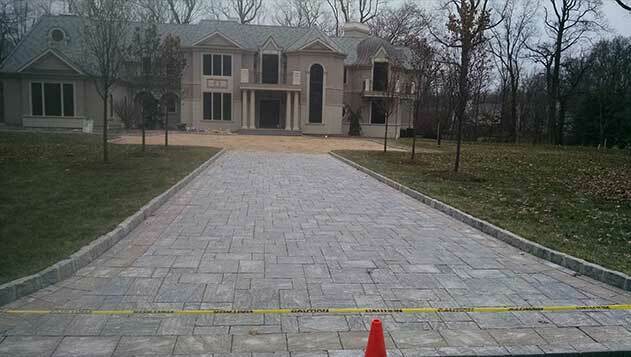 McFarlane Asphalt in Ramsey, NJ can outfit your sidewalks, driveway, patios and driveway aprons with stunning pavers and add value to your property. Just call us at (201) 327-5258 so we can set up an appointment and give you the results you want.